For as much as I love mangoes I don’t cook with them that much. Usually I just eat them fresh. I had several ripe mangoes and decided I wanted to do something more with them. Since we’ve been grilling more lately I went with this mango salsa. Like any salsa you can enjoy it with chips, but I love it as a topper for grilled meats, especially poultry or pork. Really good on grilled duck breast. 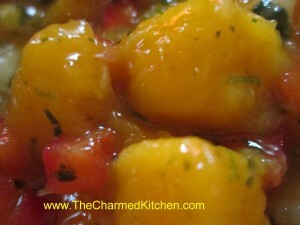 I have also added it to cold rice for a mango salsa rice salad. 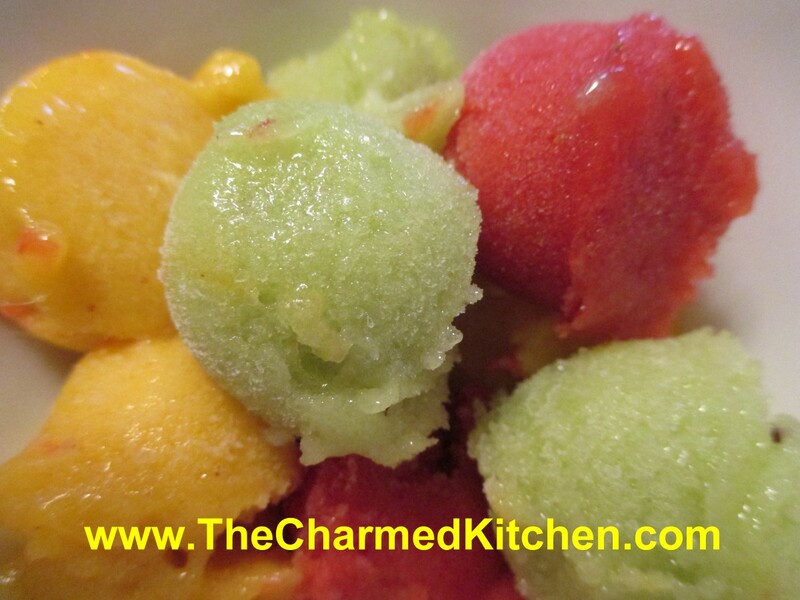 Combine all ingredients in a bowl and stir until mixed. Check seasonings. Chill for at least 30 minutes and taste again- you will likely add more seasoning. Serve over grilled meats or with chips. In a recent dinner with friends we cooked up a couple of ducks. Using ingredients I had on hand I made a glaze for one of them with a fresh mango, some fresh mandarin oranges and ginger. It had a great mix of flavors that complimented the duck quite well. Here is the recipe for the sauce. In large skillet brown onion in oil. Add remaining ingredients, except sesame oil and salt, and cook until mixture is thickened and bubbly. Add sesame oil and salt to taste. Use as a sauce on duck, poultry or pork. I cut off the extra fat and skin from the neck of the duck to save for rendering later. I also removed the wings and set aside for another use. I then cut the duck in half and placed it in a roasting pan on a rack. Season it with salt and pepper. Bake in a 425 degree oven for half an hour. Turn down heat to 350 and cook until duck is done. That will take about an hour- depending on the size of the duck. At this point I had to come up with a plan B. The oven I was using stopped working. To finish off the duck I heated up a large skillet and put the duck in the skillet, skin side up. 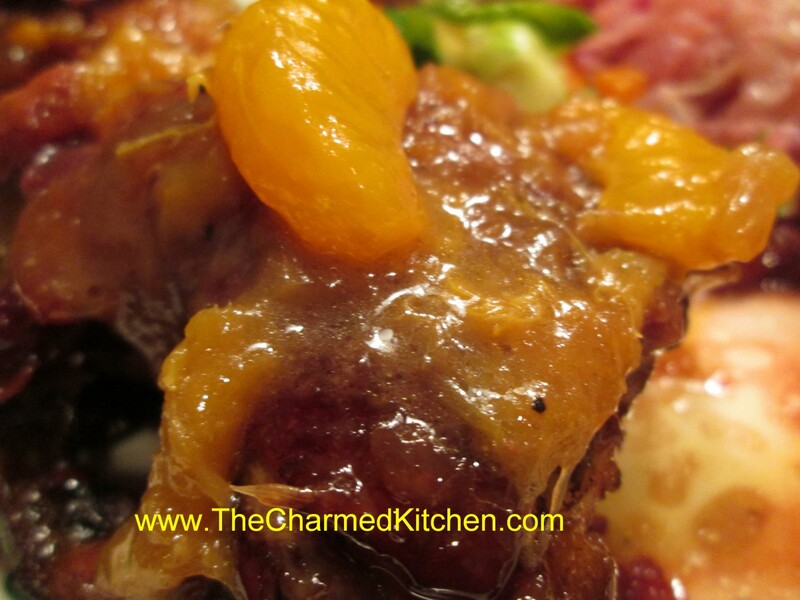 I poured the mango sauce over the duck and cooked it with the lid on for 15 minutes. Then I took the lid off and turned the duck skin side down. On medium high heat I allowed the sauce to reduce. It also caramelized on the skin making a nice glaze. If the oven hadn’t stopped working I would have finished off the duck under the broiler.